When it's that time of year make sure the Christmas cards you send stand out from the rest. It's never too early to start making your cards for this special time of the year..
Start round about October to avoid the panic as the season gets closer. If you have a big family circle or lots of friends then get busy early. And even more so if you make them for charities or to sell. And the more you need to make the more simple they need to be. These cards are made from a digital download that I bought, and they are so trendy. Try the bright, funky colour schemes yourself. Or the gentle pastels that are always so pleasing...for any occassion. 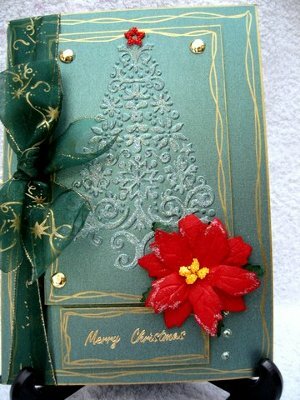 And if you want to add the appearance of snow to your Christmas Card then take a look at Flower Soft. There are always pretty papers around. 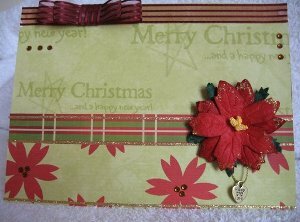 The traditional reds and greens, are always a safe bet for making lovely cards. But don't limit yourself to just these colours. Be adventurous and see what you can create. Let the Colour Wheel help you pick out the schemes that you like, before you start cutting up your papers. 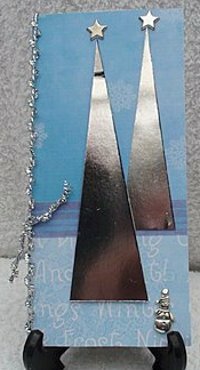 ... and by adding some matching ribbon to a darker colour scheme, rings the changes and make the card look completely different. The trees on the toppers page are very easy to do, and yet have a modern feel to them. They are suitable to send to any age group, male or female and would look good on any bodies mantleshelf. Just a bit of added glitter around the tree trunks makes all the difference. 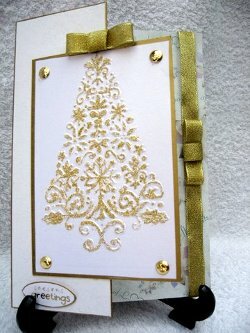 Christmas is magic, make your cards magical too.